It's Time To Redeem Your Anniversary And K1Heart1 Cash! Come And Redeem Your Cash! Now through December 22nd, redeem your $14 Anniversary Cash that you earned during our 14th Anniversary Sale Celebration! 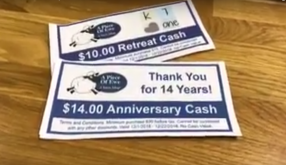 If you attended the K1Heart1 Retreat, your $10 Retreat Cash is now able to be redeemed through December 22nd! Check out our video about the cash redemption events here. If you want to create a wonderful handmade gift for Christmas but don't have the time, grab a Quick Knit Kit! Check out the scoop on it here.